Lancaster, PA –April 18, 2007 – North Star Marketing, Lancaster, PA, has recently been named the creative agency for Fenner Precision and Smiths Aerospace. Fenner Precision, located in Manheim, PA, and other offices throughout the world, is a global leader for belts, tires and pulleys in paper propulsion, motion control and power transmission applications. Smiths Aerospace, located in Germantown, MD, and other offices throughout the world, is a leading global provider of innovative solutions to builders and operators of military and civil aircraft and engines, from large transport to fighters and UAVs, from helicopters to regional and business jets. 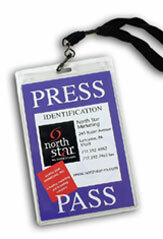 North Star Marketing is a leading full service creative branding and marketing agency specializing in integrated programs that reinforce the brand position long-term while increasing sales short term. North Star has 18 years experience and a dedicated team of brand specialists who provide nationally and locally known brands with marketing, branding, PR, interactive, advertising, strategic planning, package design, sales communication and creative services. To learn more, visit www.northstar-m.com.